Here in South Dakota last week we had about 8 inches of snow over night. The next morning we started pushing, blowing, and removing snow. From feed bunks, feed lots, our main yard; and in some cases the road. Typically, I have noticed a pattern once a blizzard warning is let out. 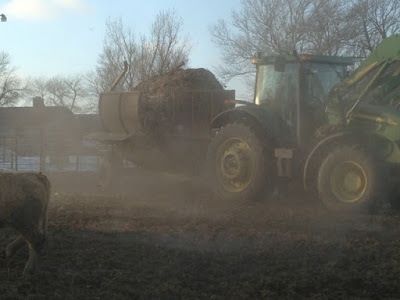 We immediately begin building up more windbreaks with our round bales of hay, pull all equipment into buildings, get snow shovels at the ready, and make sure everyone is hunkered down. Okay, who am I kidding this is pretty much a normal winter routine! In South Dakota it seems if we aren’t talking about snow, we are talking about wind. And if we aren’t talking about either of those it must be colder than cold. When it’s colder than cold there a couple of things I do, or watch my husband do, and assist when needed! First off, I make sure I check water sources for our animals. That is really important. Water is one thing that will help animals stay warm in below freezing temperatures. 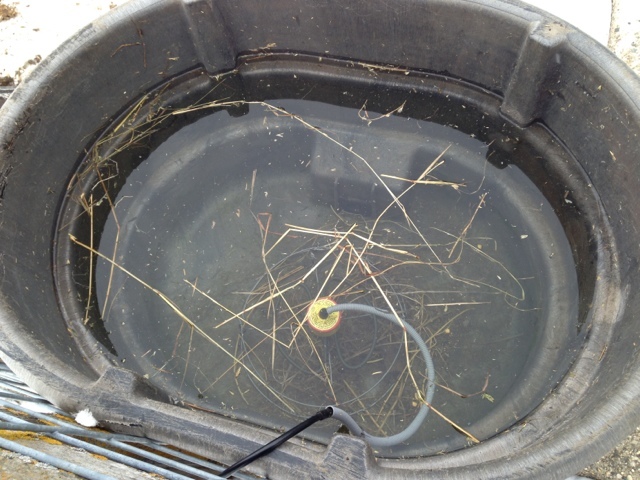 In the winter we use this fancy thing in my heifers’ water tank. It is a heating element that will keep the water from freezing. And if you remember our big yellow ones- they have a heating source inside it that keeps the water from freezing. Another thing is food. Just because snow is blowing, it’s freezing, or it’s a blizzard doesn’t mean we just skip our chores for the day. Animals always come first! 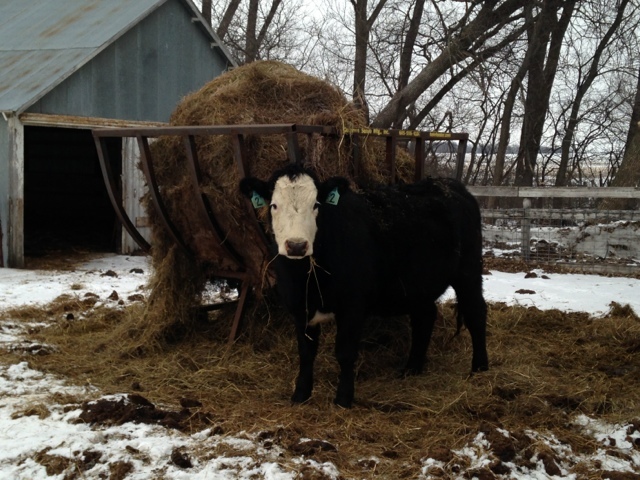 My heifers have a round bale all the time they can munch on if they want. But, they still get checked in the morning, evenings, and whenever I need a breathe of fresh air. Pretty soon that will change (It’s almost time for them to have their calves!). This is Sofie. She is rather ornery…And can be quite photogenic, when she wants to of course! 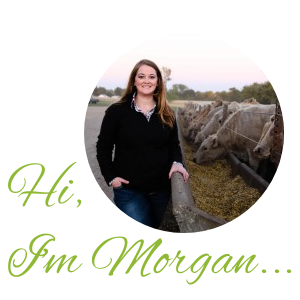 Feed lot cattle typically get fed once or twice a day, depending on what feed regimen the farmer may have them on. All livestock varies on how often they get fed, but animals are definitely checked through out the day to ensure they are all safe and sound! And bedding. 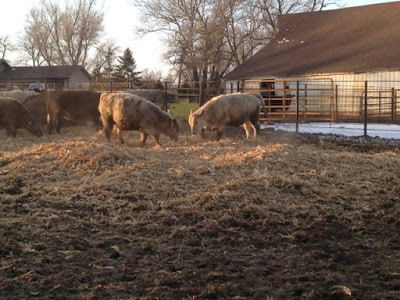 Bedding gives livestock something to “hunker” down in, as well as something to play in. I always love helping when my hubby spreads bedding because I love to watch big grown up cattle turn into little baby calves all over again. Running, playing, and teasing each other with the new “toy”. Although these little ones seem to be enjoying it just as much as the big cattle! At the end of the day, we aim to make animals as comfortable as possible in the colder than cold South Dakota winter! Any other questions on how farmers and ranchers keep livestock nice and warm?